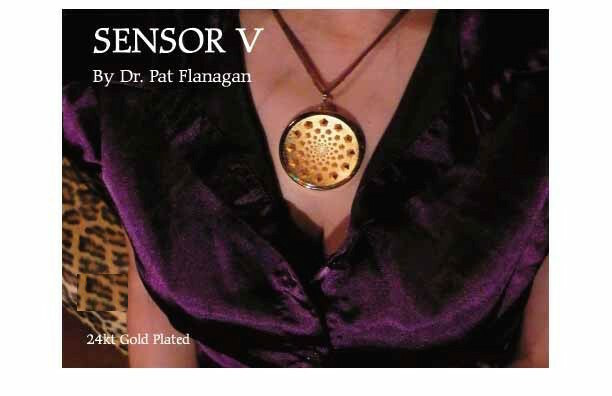 The SENSOR V by Patrick Flanagan, designed by the literal genius Dr. Patrick Flanagan for protection of harmful EMF radiation and amplification of our healthy bio-electric fields. The Sensor V is a great solution to EMF radiation, and for protection from other harmful fields. It is specifically designed to help amplify your natural, healthy bio-electric field. I absolutely love mine! I feel the difference in my bio-field as soon as I put it on. From my own experience, I also feel an increased sense of well-being despite what’s going on in my external environment. Patrick Flanagan cautions owners that it is a scalar field generator, so be careful what you are putting your attention on. Scalar energy is also referred to as superluminal, gravitical, cosmic, square-wave, longitudinal, prana, qi, torsional, tachyon, moving aether, life force, etc. There are many different names for this energy, but it is essentially the energy that is neither electrical or magnetic. Rather, it is the fundamental energy that all matter is derived from and returns to, known as the 5th element, or aether. A traditional physics understanding is inaccurate, which is why it won’t make sense to someone seeing the world through a Newtonian Standard type model of reality. Think more in terms of Nikola Tesla, Nassim Haramein, or Dr. Bruce Lipton, and less of dying paradigms like that of Richard Dawkins. This is not a strictly materialistic world we live in. The design of the Sensor V stems from quantum physics, and the physics of Nikola Tesla. This highly different fundamental understanding of reality is why the ancients built pyramids all over the world of various sizes. The pyramid design naturally harnesses and focuses this natural energy (5th element) that is literally everywhere, thereby amplifying it. Our brain and heart are also scalar field generators (as well as electromagnetic) which help to direct this creative energy through our attention, which is why the focus of our attention is so key. The additional dish shape of the Sensor V, as well as the increasing size of the 5 sided pyramids, help create a stronger field. So, think of your Sensor V as an amplifier of your thoughts and feelings affecting the greater creative field surrounding you. It will help buffer you from harmful EMF and other subtle energies, but it’s also important where you are placing your awareness and attention consistently. 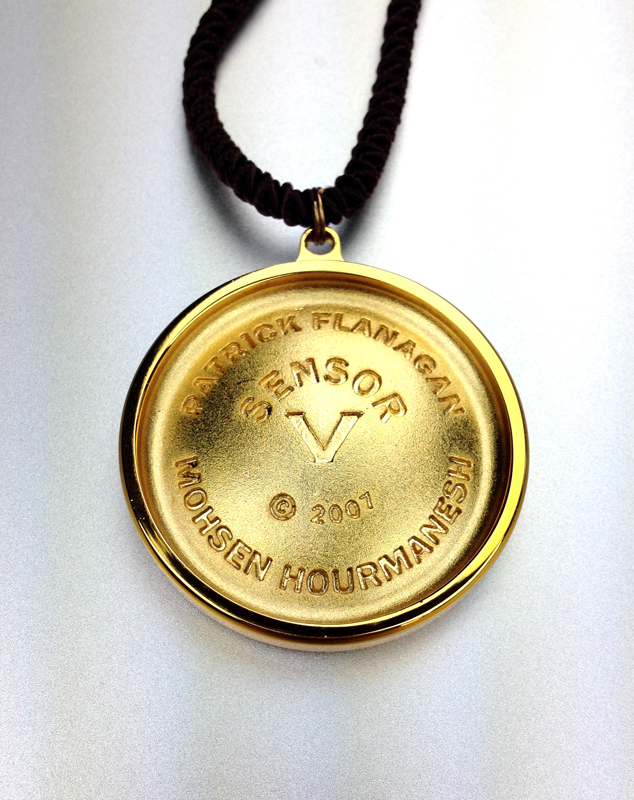 The SENSOR V by Patrick Flanagan is less a piece of jewelry and more of a “pyramid engine” or Generator. Studies show it produces temporal and spatial coherence in fields, multi-fractal dimensions and organizes harmony in the entire area that surrounds it. Its geometry is as perfect as it can be. Since Phi is a transcendental number, it generates this attempt to decimal calculations to achieve it’s powerful affect. The Sensor V creates a measurable vortex of scalar energy by using the precise dimensions and sacred geometry of the 5 sided phi pyramids. 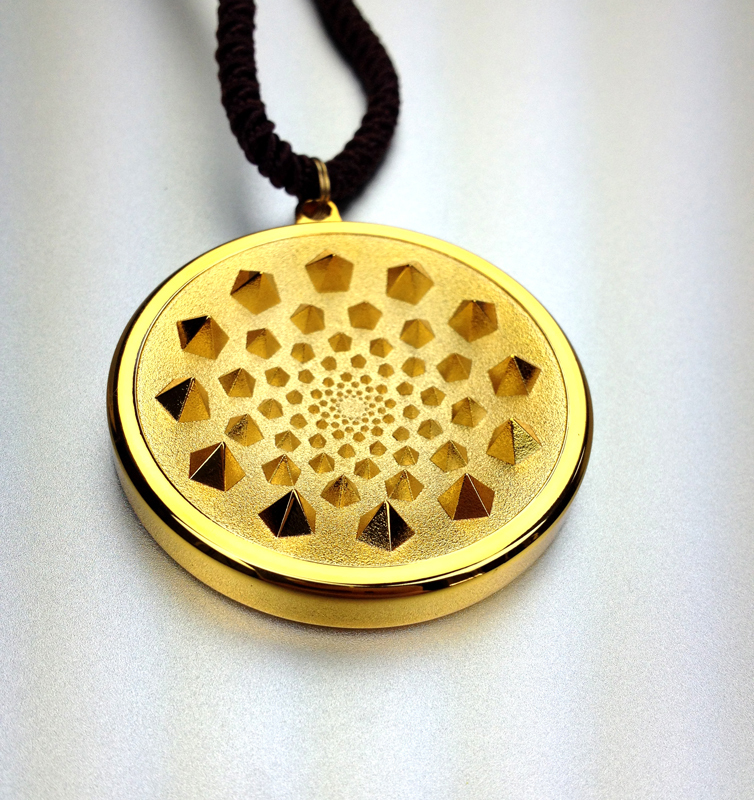 The pendant contains a spiral vortex in the golden section of these 5 sided pyramids all in perfect coordination with each other. Most impressive, is that it literally generates a coherent, holographic, multidimensional vortex. The Sensor V is cast in bronze and gold coated with real gold for maximum effect. The pendant is concavely curved as a shallow dish. The five-sided pyramids are condensed to become smaller the further inward they go. These qualities help amplify the energy vortex from the center of the sensor outward. The bio-energy field of the person is a kind of “energy plan”. Author Barbara Ann Brennan and many others believe that our physical body follows this blueprint. Essentially this means that beginning of the process of our body’s physical expression is not DNA, but rather consciousness that creates form at a much more subtle layer as our bio field. 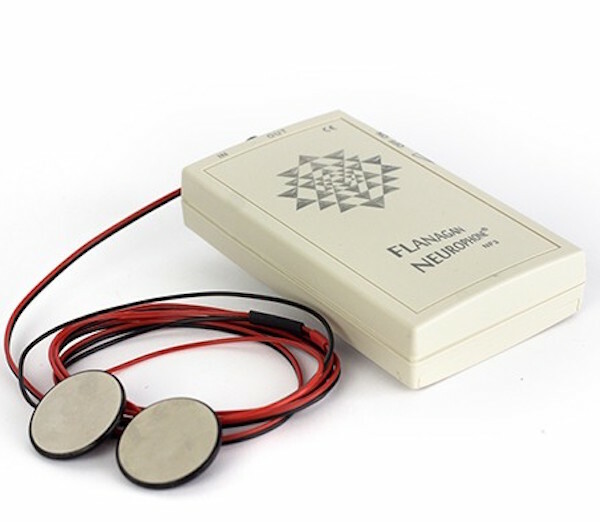 The Sensor V harmonizes the energy field and attracts positive changes to the physical body itself. PEB is a technology that can register changes in the bio-energy field. Furthermore, a test for the sensor V examined these changes after 1/2 hour to over 2 hours of wearing the Sensor V.
The partially massive changes of the diagnostic curves show that the use of the Sensor V also has a profound impact on the systemic-psychological field result. All test results indicate compensatory changes, supportive and energetic influences on local, systemic and global levels. 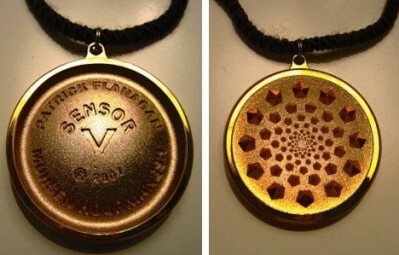 Also, See David Wolfe Necklace, The Sensor V in the film “FREQUENCY OF GENIUS”. Gabriel Cousens and David Wolfe both talk about The SENSOR V by Patrick Flanagan. Most of all, they both wear the Sensor V and recommend it to others. Finally, if you would like to learn more about the genius of Patrick Flanagan, check out the great interviews of him on GAIA (like Netflix for conscious minds). In these discussions, he tells his fascinating story, and shares some of his amazing genius. In summary, Patrick Flanagan is truly one of the most kindhearted, and brilliantly innovative visionaries alive today. If you need to return an item, first contact us. The supplier does not accept returns unless we first contact them for return instructions and only then in case of a defective item. In addition, in the event of a return, shipping would be your responsibility and the item needs to be in its original packaging. I am so grateful…..MASSIVE THANK YOU. 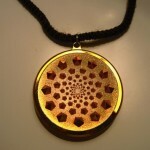 The pendant is beautiful and when I dowsed it, the energy was off the charts. Amazing! I could feel it as soon as I put it on. Am so delighted with it! Many thanks again and all best wishes. Love my necklace!.. thanks for your diligence in making sure that it got to me. Thanks I appreciate your reliable attention and follow through…. You are the best!!!!! Live Long and Prosper!!!!! I am so ecstatic…. Thanks again!!! 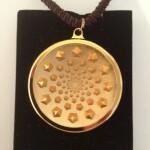 “I received my pendant today and it is amazing! Thanks for the great communication and service. I love the sensor V – it’s amazing. I’ve been feeling the best I’ve felt in a long time since wearing it, which could be a combination of factors but I’ve no doubt that it’s playing a part.